Johnny Cash won the Country Music Association's album of the year, single of the year and video of the year awards Wednesday - capturing his first CMA awards since 1969 and tying Alan Jackson for the most wins during the night. Cash, who died Sept. 12 at age 71 of complications from diabetes, was nominated for four awards and won all but one: vocal event of the year. "It's amazing my father had such a life that he could expose himself and still never lose his dignity and his charm," said Cash's son John Carter Cash, who accepted the awards with Cash's daughter, Kathy Cash. The announcements drew a standing ovation at the CMA's 37th Annual Country Music Awards. CMA voters - about 5,000 industry insiders who belong to the association - nominated him before his death for best single and video for "Hurt," a song about drug addiction written by Trent Reznor of Nine Inch Nails. Cash also was nominated for best album ("American IV: The Man Comes Around") and vocal event of the year for "Tears in the Holston River" with the Nitty Gritty Dirt Band. The "Hurt" video underscored Cash's frailty by contrasting images of a young, robust Cash from concerts and movies with new footage of the weathered and gray singer crooning, "You can have it all, my empire of dirt." Cash has now won nine CMA awards, the last coming in 1969 when he won a then-record five awards. Since then that record has been tied by Vince Gill and Jackson. 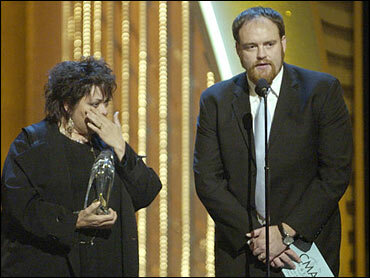 "I don't believe it's a token recognition," John Carter Cash said. "This is about a great impact in the history of music." The Cash family has suffered a tragic year. June Carter Cash, Cash's wife and John Carter Cash's mother, died in May after complications from heart surgery. Cash died in September. And last month, Rosey Nix Adams, June Carter Cash's daughter and Cash's stepdaughter, was found dead in a camper bus from accidental carbon monoxide poisoning. "It's been a pretty tough year, pretty intense," John Carter Cash said. "But coming here tonight is almost like a beginning for my father in a lot of ways." Jackson won three awards, including vocal event of the year for his hit duet with Jimmy Buffett, "It's Five O'Clock Somewhere." Jackson also won male vocalist of the year and entertainer of the year - giving him 16 career CMA awards. Gill, who hosted Wednesday's show, holds the record with 18. "Thank you, Alan Jackson - I'm glad I can help your struggling career," Buffett joked. "It was about 31 years ago I came to this town to pursue my musical madness. I never won anything for anything and it's great to do it here." Jackson said, "Thank you, Jimmy. No problem." Martina McBride got the nod for female vocalist of the year over Dolly Parton, Patty Loveless, Alison Krauss and Terri Clark. "I'm so honored to be in this category," McBride said. "Dolly Parton, my God, she's my female vocalist of the year every year." Oklahoma native Toby Keith led all nominees with seven but was shut out. Keith was nominated for best entertainer, male vocalist, and album of the year for "Unleashed." "Beer For My Horses," a collaboration with Willie Nelson, was nominated for best song, single, music video and vocal event. Keith, whose other hits include "I Wanna Talk About Me," "Who's Your Daddy," and "Courtesy of the Red, White & Blue," has long been a popular choice for nominations. But despite his multi-platinum sales success, he's won only one CMA award - male vocalist of the year in 2001. The Dixie Chicks, country music's most controversial act this year, also were shut out. The group was nominated for vocal group and album of the year for "Home." Singer Natalie Maines upset many country fans earlier this year when she told a London audience shortly before the Iraq war that the group was "ashamed" President Bush is from her home state of Texas. Maines apologized for the phrasing of her remark, but some radio stations banned the group's singles. The Dixie Chicks did not attend the show.